No bonus tracks on the 2006 re-master. The album came with liner notes but no lyrics; PLEASE DON'T WRITE FOR LYRIC SHEETS - THERE AREN'T ANY! (De songs don' suit!) wrote Mr. Hammill. 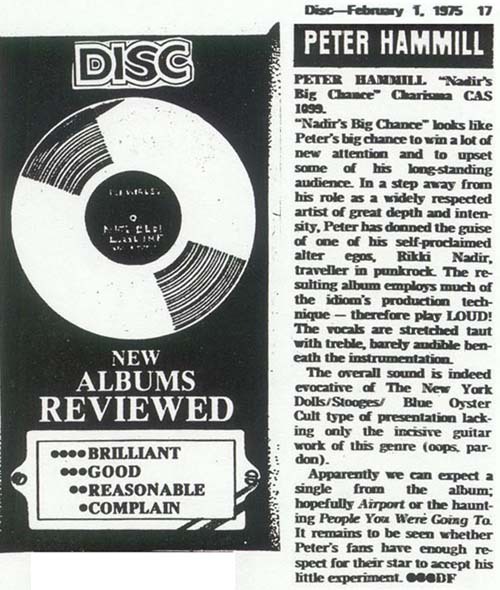 If you wish, you can read the sleeve notes describing how the album came about. 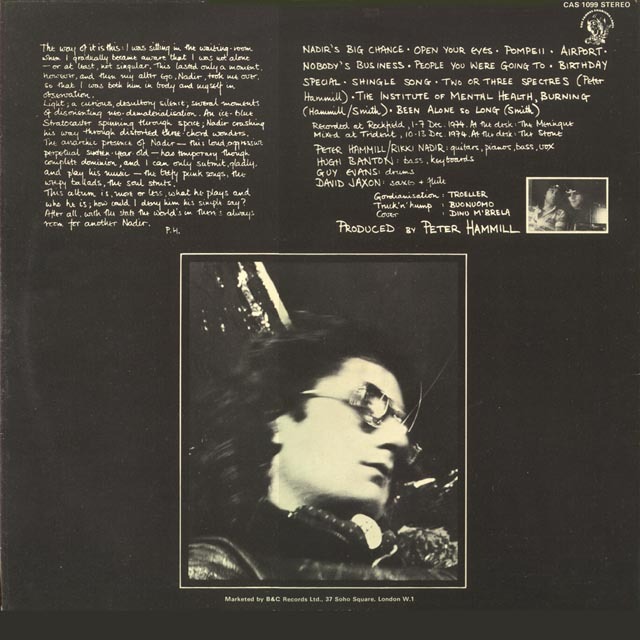 I first heard this album on the radio in my car, on the evening of the 6th. February 1975. I remember the occasion because I was on my way from Brighton to deepest Essex (Great Bentley to be precise) with a friend and his girlfriend, at the time. Steve wanted to go home for the weekend and invited me along. I'm uncertain why we were in my car but at that time Steve had an old (ancient) Austin and maybe we weren't sure if it would make it. 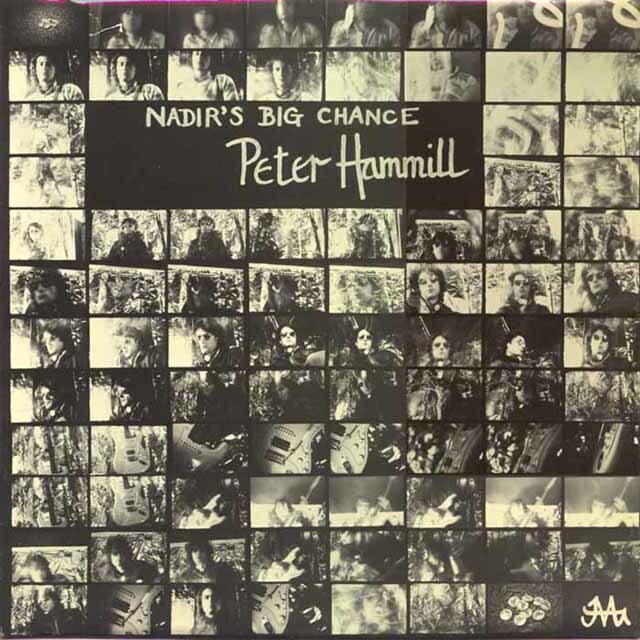 Anyway, suddenly, no doubt on John Peel's show, there came on the radio Peter Hammill's new album, Nadir's Big Chance. I pulled up by the side of the road and my passengers were polite enough not to complain. Steve was an arch John Martyn fan. 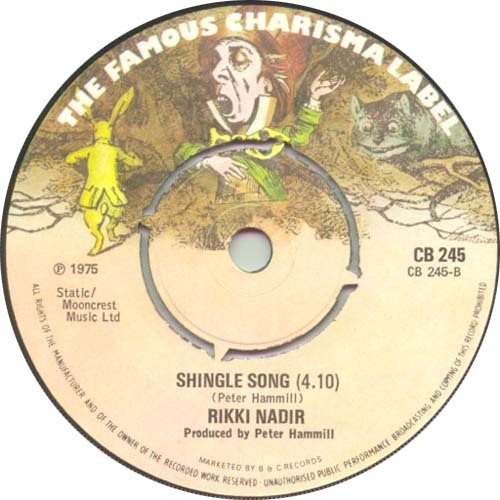 This is an interesting interview where Hammill exposes his various alta ego's; Rikki Nadir, Rodney Sofa, Heater Panel, Derby Dazzler and Dinu m'Brella! There is a remarkable similarity though between this piece and a previous one from Geoff Barton about In Camera, especially the picture. This album was a favourite of Johnny Rotten. 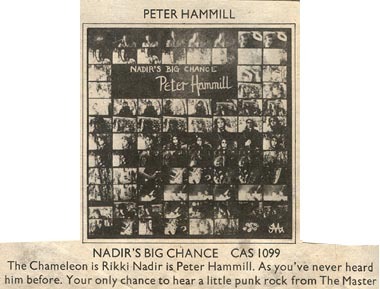 The album was a departure from PH's "normal" stuff and has been cited as the first punk album. 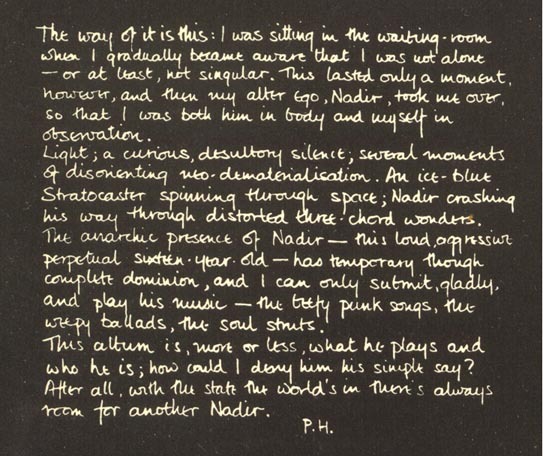 I note that the word "punk" actually appears in the sleeve notes. 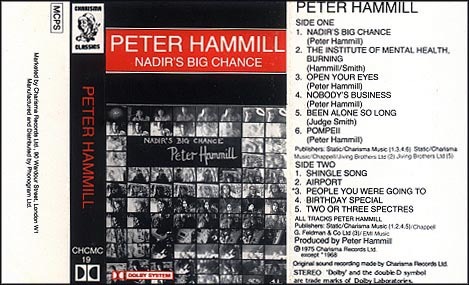 There's no doubt that the title track is a parody and put down of "Glam Rock", the lyrics are quite clear about that, so what the hell, I'll accept that Peter Hammill started punk! 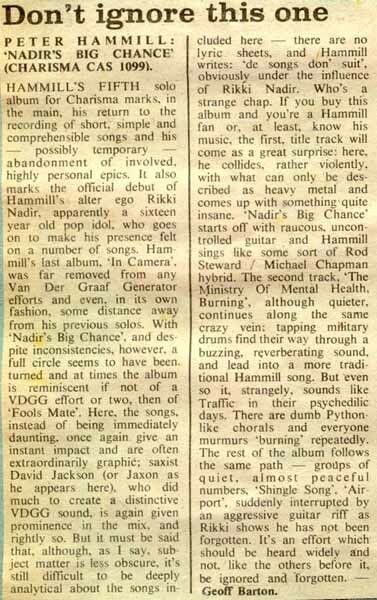 (Nadir's Big Chance, the title track, appears on the live Vital album recorded at the Marquee in 1978, which the band performed as an encore). 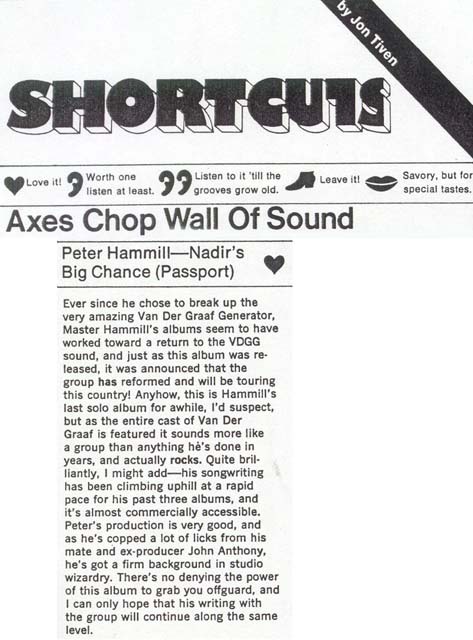 That leaves us though with a certain irony, in that so-called progressive music, of which Hammill and Van der Graaf were a part, died with the birth of punk proper. 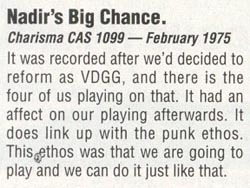 I remember being bitterly disappointed when John Peel discarded progressive in favour of punk in '76. I recovered pretty quickly and dashed out to buy God Save The Queen, but progressive rock never did. In retrospect I believe progressive music was a con. We, the followers, believed in the integrity of the songwriters/musicians and were against "hype". We were conned by a number of bands who at the end of the day turned out to be actors and ultimately made it rich (not that I resent them their wealth). The two that spring to mind are Genesis and Pink Floyd. 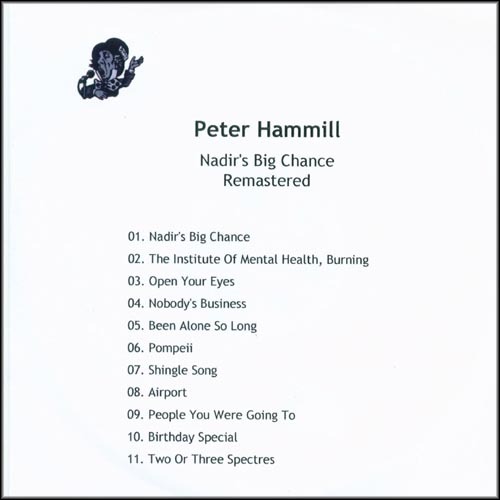 Peter Hammill is one of the few who actually had and still has, musical integrity. I actually bought the album on the 17th. 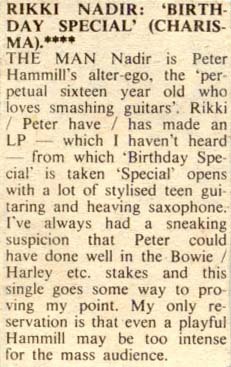 Feb 75 in Brighton and whilst it is often slated, I still like it. Favourite track? 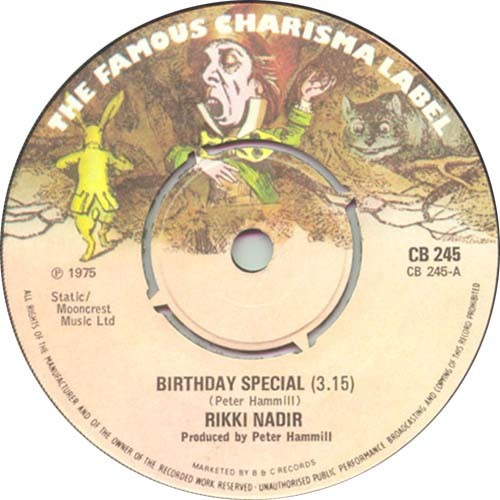 I guess Birthday Special.